The Dallas Arboretum’s Cool Thursdays Concert Series presents Majesty of Rock, a tribute to Styx and Journey on April 26 for the first time. The following Thursday, the Arboretum welcomes fan favorite Johnny Cash tribute band Walk the Line on May 3. Enjoy Dallas’ only concert series overlooking the picturesque White Rock Lake on the award-winning Martin Rutchik Concert Stage & Lawn. Majesty of Rock enjoyed performing their tribute to Journey; however, frontman John D’Agostino also loved another American supergroup, Styx. Turns out the other band members were also huge Styx fans, so they began adding some of Styx’s best tunes to their already expansive repertoire of Journey material. The audience response was so positive, they formed the concert extravaganza, Majesty of Rock. Walk the Line has performed throughout the United States and Europe for years – the sights and sounds resemble the Johnny Cash country fans fell in love with years ago. It is a must-see for any Johnny Cash fan. 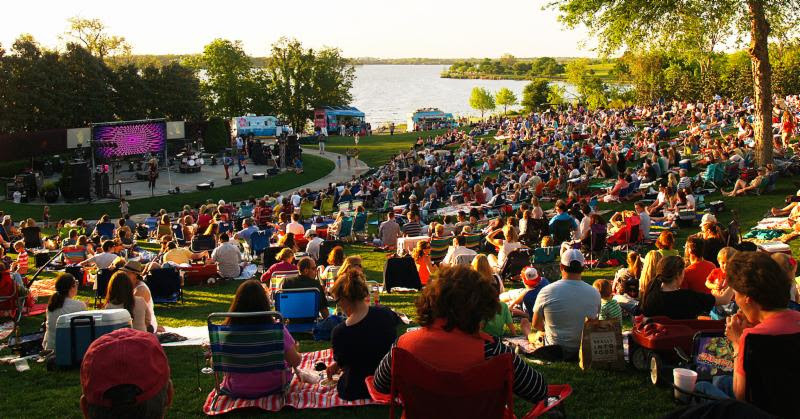 In addition to the coolest view of White Rock Lake, you can bring picnics and beverages or purchase food items from one of DFW’s favorite food trucks including Rick’s BBQ, Grub Tub, Yim Yam, Easy Slider, and Kona Ice. The gardens are also open to stroll through before the concert to enjoy the breathtaking floral displays and new summer exhibit, Wind Sculptures in Motion: The Kinetic Art of Lyman Whitaker presented by Reliant. The Cool Thursdays Fall Concert Series runs through June 28 and September 6 to October 25, 2018. All concerts are held on the Martin Rutchik Concert Stage & Lawn. Gates open at 6 p.m. Spring concerts are 7:30 – 9:30 p.m., fall concerts 7:00 – 9:00 p.m. The garden closes at the conclusion of each concert. In the event of inclement weather, the concert will be moved inside to Rosine Hall. Due to limited space, inside seating is based on a first come, first served basis. Guests are encouraged to arrive early, bring low-to-the-ground chairs and blankets as no seating is provided. A determination of weather-altered plans will be made by 3 p.m. on the day of the concert. Check the homepage or Facebook page for updates the day of the concert. Tickets: Prices for single tickets range from $10 – $27 and are available for purchase online. For group tickets of 15 or more, call 214.515.6520. On-site parking is complimentary for all concerts, and the Arboretum encourages attendees to take advantage of the close covered parking available at the parking garage located across the street from Rory Meyers Children’s Adventure Garden with access underneath Garland Road. The Dallas Arboretum and Botanical Garden is located on the southeastern shore of White Rock Lake at 8525 Garland Road, Dallas, Texas 75218. The Dallas Arboretum is also the home of the internationally acclaimed Rory Meyers Children’s Adventure Garden. The Arboretum is open daily from 9 a.m.-5 p.m. For more information, call 214.515.6500 or visit www.dallasarboretum.org.